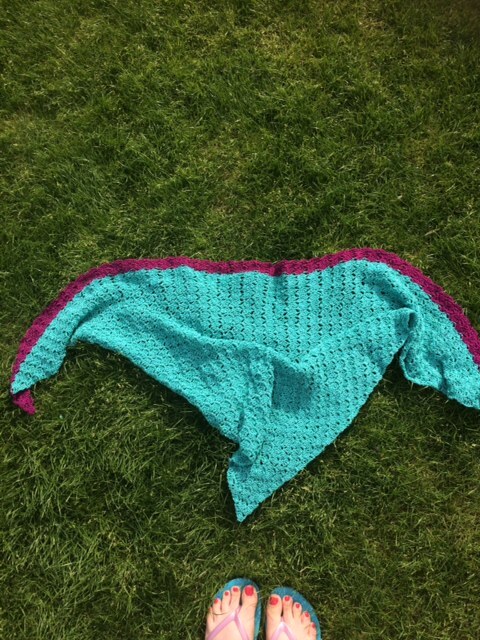 I haven't blogged about any of my crochet projects for ages. The last few months have been super busy and I have crocheted loads including what feels like a gazillion baby blankets for family and customers. 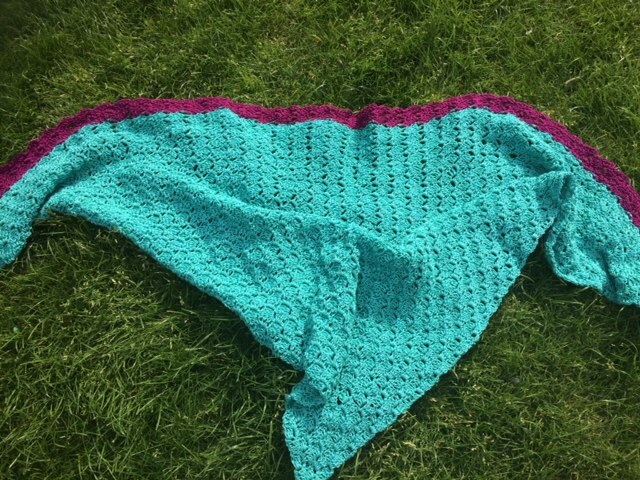 I decided I needed to make something for myself for the cool summer evenings (and days) so I made myself this gorgeous shawl. 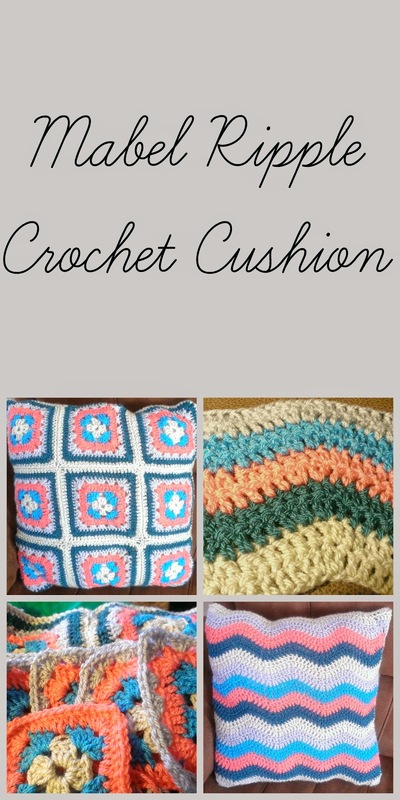 Its just a corner to corner pattern that is easy to crochet once you understand the pattern. Its essentially boxes of triple stitch. 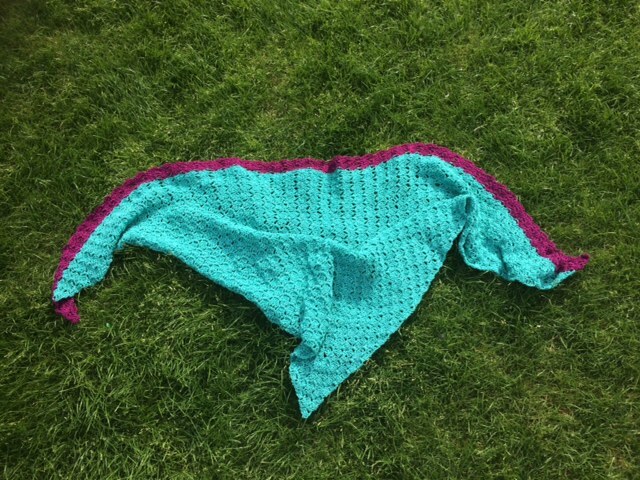 I have been making my current blankets in this stitch and thought it would make a great shawl. I just kept going until it was big enough for me. The yarn it Patons 4ply mercerised cotton which I got from a charity shop. I got a huge bag of the mint green colour, in fact I have several balls left. The purple came from the same charity shop haul and I still have some of it left as well. I used 3 balls of the green and then did the final two rows in the purple. It was so quick to work up and drapes like a dream. Its perfect for when I am sitting n the garden at night and will make a great scarf in the spring. The corner to corner pattern is super simple and you can find loads of patterns online. The Crochet Crowd have a great corner to corner video tutorial if you google it. I am currently working on a stunning beaded shawl which I put aside until I have the time to focus on it as its a bit fiddly. Next up I am working on several blankets for Christmas gifts and I have a commission for two picnic baskets of food which I will blog about one day!